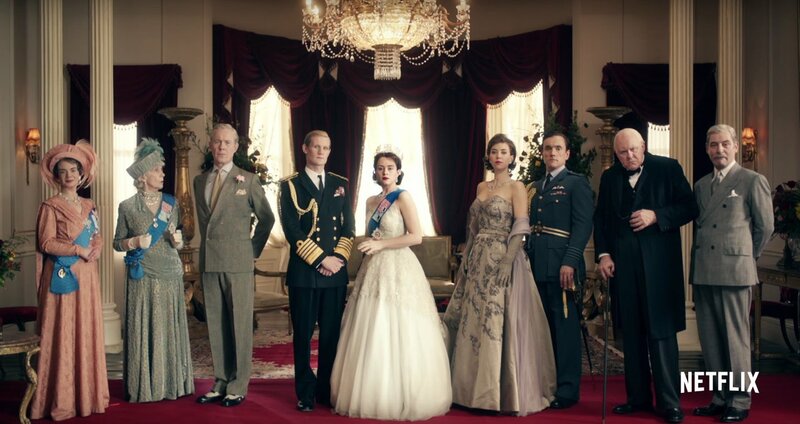 Anglophiles still mourning the ending of Downton Abbey have begun watching The Crown, a Netflix original about the beginning of the reign of Queen Elizabeth II. The series is beautifully made, and instead of bingeing on it, I find myself wanting to savor it slowly. This piece contains some spoilers about the first half of the series. One of the first scenes in the first episode focuses not on Elizabeth herself but rather on her husband-to-be, Prince Philip. In this scene, before Elizabeth becomes Queen, Philip formally renounces the Greek and Danish titles that were the privileges of his birth. He does this, presumably not because he loves dear old England so much, but because he wants to marry the heir apparent to her throne, then Princess Elizabeth. He receives a new title and a strong but formal handshake from his father-in-law, King George VI, and finds his intended, Elizabeth, waiting anxiously in the next room. I don’t want to like him. He doesn’t seem…grateful enough, somehow. Like most of us, I “know” Prince Philip in the 21st century, as the 90-something-year-old grandfather and great-grandfather who makes embarrassing, off-color jokes and trails behind his Queen with a sardonic smile on his face. I was certainly not prepared to relate to him, and so when he said the bit about signing himself away, I flinched a little, knowing I’ve thought the same thing about myself, and the parts of myself I’ve “signed away.” And I’m certainly not grateful enough. The episode continues with Philip’s struggle to understand his role in the royal family, especially as his father-in-law’s health deteriorates, and Elizabeth’s role as the future monarch becomes more prominent. Philip loves his career as a naval officer, which he gives up in order to travel the world with Elizabeth, resentfully: “My work is as a naval officer, not grinning like a demented ape while you cut ribbons.” Ouch again. Sensing tension and knowing his own frail health will bring about his daughter’s reign sooner rather than later, King George takes his son-in-law shooting in the country, presumably to blow off some manly steam, but also to remind Philip of his duty to the family, and to Elizabeth. “She is the job. She is the essence of your duty — loving her, protecting her. Of course you’ll miss your career, but this for her and for me will be a greater act of patriotism or love.” Oof. Sorry, man. Like Philip, I’ve given up parts of myself for someone I love, but also out of loyalty to something larger than either of us. My husband is a member of the clergy, and while his career has never required that we travel to the ends of his family’s empire, it has nudged some sacrifices out of both of us. Like Philip (or at least the Philip portrayed in The Crown), I worry about the toll the role takes on our children. Like Philip, in a fashion, I’ve given up my name; even if I hadn’t, I would’ve nevertheless somehow acquired the title of “The Rector’s Wife” in its place. I don’t pretend not to resent it. Like Philip, my marriage has become something of a public commodity, albeit for a much smaller audience. Like Philip, I’ve introduced awkward and unseemly objects in holy places: for him, it was the cameras that televised his wife’s Coronation in Westminster Abbey, and for me, it has always been…myself, in whatever church my husband is serving. Like Philip, “they” certainly think that I’ve won the greatest prize on Earth. Like Philip, I think so, too. And most of all, like Philip, I do it all very imperfectly and clumsily. Throughout the first few episodes, I found myself cringing in recognition at Philip’s predicament more and more. Whatever his motives, he seemed to be trying to get it right, and I recognized his clumsiness and failures as something very familiar in my own life. I find myself drawn to this character and this person, whose imperfections and flaws are on display for all the world to see. I’ve felt that way, too. Well our feeble frame He knows…Philip’s, and mine, and the Queen’s, too. Thank heaven for that. WOW!! When is that book coming out? You are amazing Carrie!! Fantastic writing and perspective taking, Carrie! I have always marched to my own drum, and I think my children have too. Perhaps I was fortunate, or Ed was unfortunate, that I never gave a second thought to what others thought or expected. I recommend that approach. It never seemed to hurt him or his life in the church, and I have had a very happy life. You’d have to ask my children, but I don’t think they struggled with that PK tag.